Girl Friday Productions is a theater company that specializes in large cast classic American plays. The bad news is they only do one production every two years. The good news is it's worth the wait. 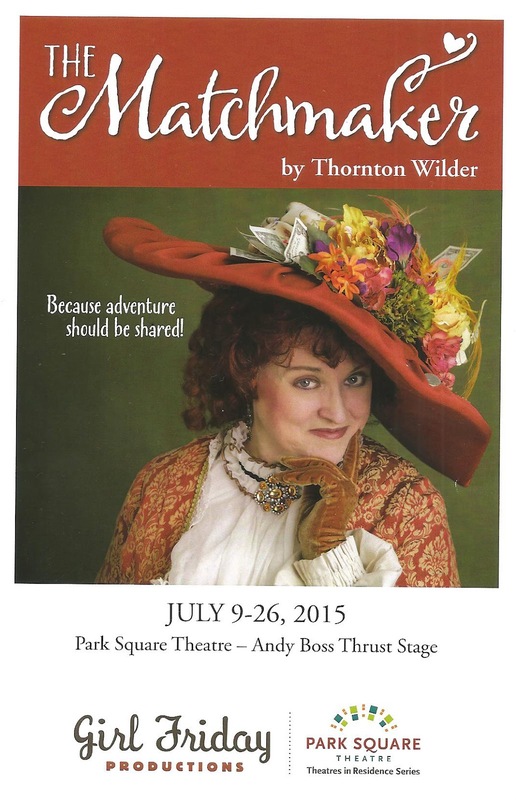 In their first time partnering with Park Square Theatre, they're presenting Thornton Wilder's comedy The Matchmaker (which you may know in its musical version as Hello Dolly!, seen at the Chanhassen just last fall). 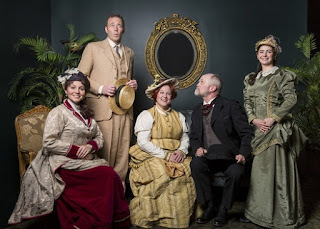 With a funny and poignant story about love, money, and adventure, smart period set and costumes, a cast that is sheer perfection, and direction that keeps it all running smoothly, this Matchmaker is an absolute delight from top to bottom, start to finish. It's my favorite of the three Girl Friday shows I've seen (also including the sprawling drama Street Scene and Tennessee Williams' most bizarro play Camino Real). Go see it now (playing through July 26), or wait another two years for your chance to see this great company. Widow Dolly Gallagher Levi is the matchmaker here, and then some. She makes a living providing necessary services, but she's tired of the hard work and sets her sights on wealthy client Horace Vandergelder. What Dolly wants, Dolly gets, even if it takes some master manipulation to get there. Caught up in her web are Horace's niece Ermengarde, who longs to marry the artist Ambrose Kemper against her uncle's wishes, Horace's hard-working employees Cornelius Hackl and Barnaby Tucker, who long for adventure outside of their Yonkers store, and Horace's prospective match Irene Molloy, a widowed hat maker who runs her store with the help of flighty Minnie. Their paths all cross on one wild night in New York City. It's a grand adventure for one and all. Girl Friday has assembled a dream cast, under dream director Craig Johnson (who, BTW, won an Ivey for his direction of the aforementioned Street Scene). Karen Wiese-Thompson is a brilliant comedic actor (seen frequently on the Ten Thousand Things stage, er... floor) and therefore a perfect choice for Dolly, bringing all of her biting humor, warmth, and spirit to the role. Alan Sorenson is wonderfully grumpy as Mr. Vandergelder. His employees Cornelius and Barnaby couldn't be cuter than Dan Hopman, oozing with aw shucks charm, and Vincent Hannam, the only unfamiliar face in the cast but fitting right in as the adorably naive youngster. Lindsay Marcy's Irene is strong and funny and determined to find adventure, while Christian Bardin creates a delicate, flighty, high-voiced, hilarious character in Minnie with every look and movement. Elizabeth Hawkinson and Sam Pearson are charming as the young lovers Ermengarde and Ambrose, and the former is blissfully less shrill than her musical counterpart typically is. Sam Landman is, as always, a joy to watch as the New Yawk accented assistant with questionable motives, who delivers an amusing and not unwise speech about nurturing one but only one vice. Girl Friday Artistic Director Kirby Bennet makes a fourth act cameo as the delightfully loopy Mrs. Van Huysen. Last but not least, David Beukema and Dana Lee Thompson play multiple roles with gusto and personality, and several quick changes - sometimes onstage! Park Square's basement Andy Boss stage had been transformed into charming old NYC with images of city streets on either side of the stage and a screen that's lowered between the four acts to announce the setting, with changing displays in the openings at the back of the stage to further define the four locations (set by Rick Polenek). The thrust stage is put to good use, especially in the several soliloquies delivered by various characters as they walk around and look directly at the audience. Kathy Kohl's costumes are scrumptious (if I may borrow a word from that other American classic playing on the other side of the river), especially the women, dressed in flounces, bustles, and hats. The characters in The Matchmaker are searching for happiness and finding it in different ways - love, money, adventure, employment, a home. Young Barnaby gives the closing speech, wishing the audience the right amount of adventure and sitting at home. Perhaps he's stumbled on the key to happiness - finding that correct balance between adventure and sitting at home. Some people need a lot of adventure to be happy. For others, like Bilbo Baggins, one great adventure can last a lifetime of sitting quietly at home. Girl Friday's The Matchmaker is definitely an adventure worth leaving home for. Funny, entertaining, poignant, well-written, -acted, and -directed - an all-around delightful production of an American classic (playing now through July 26 at Park Square Theatre).